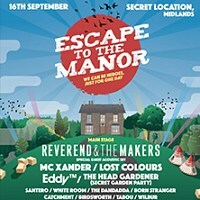 New for 2017, Escape to the Manor features live music, arts and crafts, a games tent hosted by Game Face Live, local food and drink, yoga and a dedicated kids area. Music for 2017 included: Joining Reverend & the Makers, Eddy Temple Morris, MC Xander, Lost Colours, The Head Gardener, Santero, White Room, The Dandadda, Born Stranger, Catchment, Birdsworth, Tabou, Wilbur, Ginger Snaps, Drunken Mandem, Charlotte Carpenter, Diz Mack, Amaroum, Jono and the Uke Dealers, Jamie Benkert, Cousin Avi, Harry Pane and more. The 2017 event will also help raise money for different charities, including CALM, the MS Society and the Church of All Saints.